The Kerala High Court has recently held that the police could not register cases for drunk, rash and negligent driving under the provisions of the Motor Vehicles Act without obtaining prior permission from the Magistrate concerned. This interesting ruling by Justice Thomas P Joseph in the case of Mehaboob v. State [Crl M.C 702/2011 dated 30th March 2011] has instantly attained the status of a “classic”; and it has become a boon for many Malalyalies who are incidentally known for their high liquor consumption. In the above case, the petitioner was an accused under Sections 184 and 185 of the Motor Vehicles Act, 1988 [hereafter referred ‘MV Act’]. The Magistrate took cognizance of the offences and issued process to the petitioner on receipt of a charge-sheet submitted by the Sub-Inspector of Calicut City Traffic Police. The petitioner although filed a petition for discharge under S.258 of the Criminal Procedure Code [hereafter CrPC], it was dismissed by the Magistrate. Therefore, he challenged the said order before the Kerala High Court. The Kerala High Court noticed that the maximum punishment that could be awarded in any circumstances stated in Section 184 [Driving Dangerously] is imprisonment up to two years or fine which may extend to `2,000/- or both. So far as Section 185 [Driving by a drunk person or by a person under the influence of drugs] is concerned, the maximum punishment available there against is imprisonment up to two years or with fine which may extend to `3,000/- or with both. In neither of the sections, the nature of the offences viz whether it is cognizable or non-cognizable, is stated. Therefore, the court was forced to make references to Sections 2(c),(d) and First Schedule of the CrPC. Part II of the First Schedule of CrPC deals with classification of offences under other laws and category no. 3 therein states that ‘if the offence is punishable with imprisonment for less than three years or with fine only, such offence is non-cognizable and bailable in character.’ Hence the court declared that Offences under Sections 184 and 185 of the Motor Vehicles Act are non-cognizable and bailable offences. Another pertinent provision is Section 202 of the MV Act. It empowers a police officer to arrest without any warrant any person who in his presence commits an offence punishable under Sections 184, 185 [or Section 197-Taking vehicle without authority] of the MV Act. The proviso thereto says that any person so arrested under Section 185 shall within two hours be subjected to a medical examination, failing which he shall be released from custody. The court found that the limited power granted to arrest a person without warrant is in order to facilitate immediate medical examinations as provided under Section 203[Breath Test], 204 [Laboratory Test] etc alone, and it would not change the character of the offence or its non-cognizability. Therefore, the person arrested under Section 202 without warrant, after the purpose is over, has to be released as provided under Section 436(1) of CrPC [if he is prepared to give bail] and the case has to be proceeded as in the case of a non-cognizable offence. In case of non-cognizable offences, under Section 155(2) of CrPC, a police officer could not register a case or conduct any investigation without the prior permission of the magistrate concerned. An investigation conducted in violation of the said provision is stamped as illegal. In the present case, the police officer notwithstanding that offences under Sections 184 and 185 are non-cognizable, proceeded to register a case as if they are cognizable in character, without obtaining permission from the Magistrate. Therefore, the First Information Report [FIR], the investigation ensued, chargesheet field under S.173(2) of CrPC and subsequent cognizance of the offences by the Magistrate, were held illegal and the case registered thereon was quashed. There are millions of summary trial cases improperly registered under Sections 184 and 185 of the MV Act, pending in various Courts of Kerala. The court being mindful of the above unfortunate fact laid down the procedure to be followed in such cases. The court held that when a final report relating to commissioning of a non-cognizable offence made in violation of Section 155(2) of CrPC is brought to the notice of the Magistrate, he has to apply his mind and decide whether it is a case where reinvestigation has to be ordered, or whether it could be treated as a complaint under Section 2(d) and Section 190(1)(a) of the CrPC, and cognizance could be taken. Such complaint would proceed as if it is a complaint filed by a public servant acting in discharge of his official duty; and it would be subject to provisions of the law relating to limitation etc. This judgment has ruffled the police authorities and the government which hitherto had an unexplainable upper hand in booking offence of drunk and driving in Kerala. 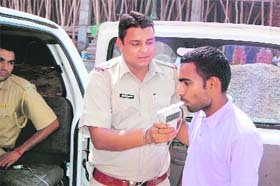 The offence known for its lucrativeness was indiscriminately employed by the traffic authorities during the end-of-months-dry-periods and to accomplish booking targets. This judgment should be a stop-breaker for such despicable governance, if viewed from the perspective of an ordinary Malayali.